Savannah Bee Acacia Honeycomb Jars bring to you the best of both worlds -- quaility Acacia Honeycomb suspended in golden Acacia Honey. Acacia honey is one of the most sought after honey varieties. It sits at the pinnacle of the honey world and is well-loved for its nearly white-gold color, mild taste, and incredible clarity! "The honeycomb jars of our past were always a best-selling product but supply was so low and the labor it took to hand fill the jars forced us to retire them. These beautiful new jars have a clear label showing off the natural splendor of the white honeycomb floating in the light Acacia honey. You won't see this kind of quality anywhere else but right here at Savannah Bee. We are patting ourselves on the back and we feel absolutely fantastic offering our customers something of such rare and delicious beauty." 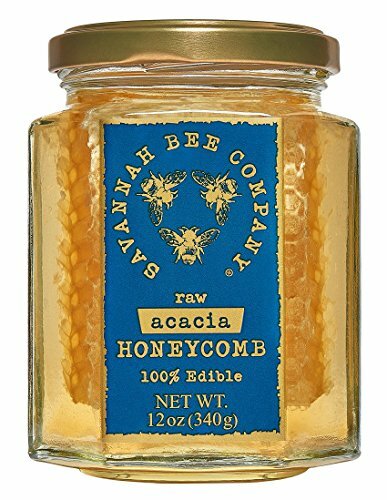 - Ted Dennard Savannah Bee Acacia Honeycomb Honey is sold in 12oz hexagonal jars and is Kosher certified.